← Wienermobiles Drive Across America! 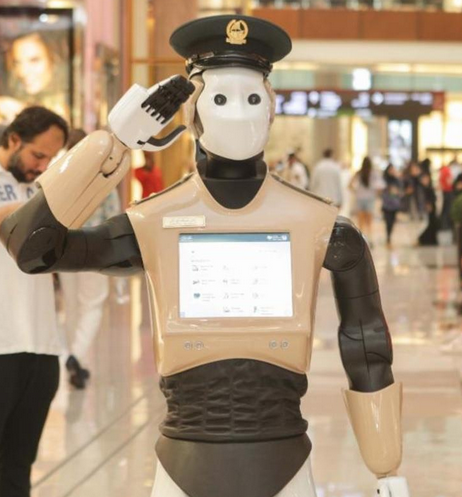 In what may be the world’s first Robocop, an autonomous robot policeman has reported for duty in Dubai on public streets. This is just the start: Dubai has plans to make 25% of the city’s police force robotic by 2030. The 1.7m high Robocop weighs approximately 100kg. An embedded touchscreen on its chest allows people to report crimes and pay fines for traffic violations. It also includes facial recognition functions to identify a person’s emotions and facial expressions, and can change its expression and greetings to help put people at ease. Facial recognition technology helps police officers identify and catch offenders. It can also broadcast live video feeds in times of emergency. Robocop can communicate in six languages, including Arabic and English. And, lest you think Robocop isn’t friendly, it can shake hands and offer salutes. Robocop can also chat and interact with people, helping to put them at ease. And of course, Robocop links to social media such as Twitter, just like everyone else! Discuss with students the role of robots in society and business. What are their ideas on how robots could be useful? Harmful? Divide students into teams and have them discuss legal and ethical considerations of Robocop.